TP Research has released Video Comments, a plugin that lets users publish videos on WordPress blogs and let viewers add time-based comments.A popup window displays the video and comment area. 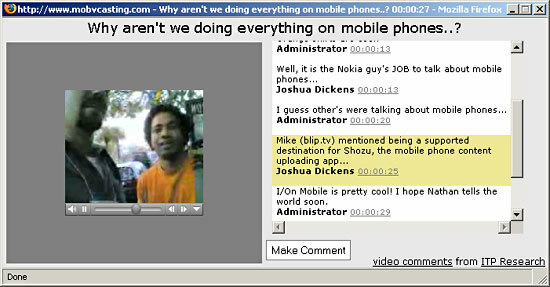 As a video is played, the comments associated with a current video time are displayed. Viewers can also scroll through the comments and click them to jump to a specific point in the video. The comments are saved in the WordPress database, so no additional configuration is needed. All comments are listed in the individual post as a custom field and can be easily modified or removed by the editor. The plugin also publishes the comments as an RSS feed. ITP is also working on a service that lets Video Comment users register their blog so their site can be crawled. Using the comment feeds, ITP is developing algorithms to aggregate the commons and do things like display comment tag clouds. A prototype aggregator is under development called Video Comment Flavors. Video Commments is developed by Shawn Van Every, Daniel Shiffman, John Schimmel, Josh Dickens and Dan O‚ÄôSullivan.